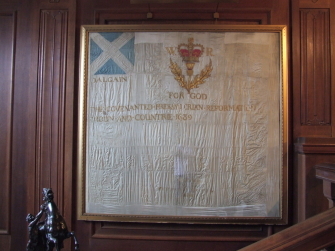 The Sorn parish (Dalgain parish) flag is on display in Sorn Castle, a private country house. At the time of the Covenant, Sorn was referred to as Dalgain. The flag is typical of Covenanter flags of the period, with a saltire in the hoist, a thistle and crown in the centre, and a motto underneath. Sorn Castle is a private dwelling located to the west of the village of Sorn in Ayrshire. The castle is open to the public at times during the summer months - see castle website.